Imagine if Phil Connors, the caddish weatherman Bill Murray played in Groundhog Day, never broke his karmic loop and just kept waking up on February 2 for the rest of eternity, even after getting every detail of his one and only day just right. That’s kind of what it feels like to watch one of the countless variations on the 1993 comedy: Since they already perfected the premise, isn’t returning to it over and over and over again kind of pointless? 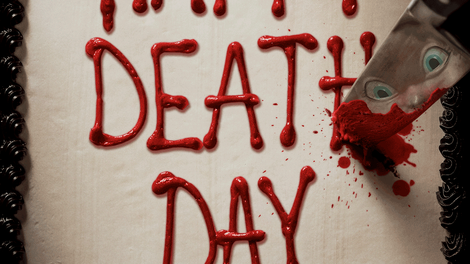 No less than the year’s third attempt, after a mopey YA version and a dopey Marlon Wayans one, Happy Death Day is basically the Scream of Groundhog Day knockoffs, trapping a pretty coed in a repeating cycle of fear, as she’s forced to relive her own inevitable murder in perpetuity. It’s a reasonably clever spin, but not much more than that; once the novelty of the genre swap wears off, you’re just watching another inferior variation. Every day is a birthday is a death day is the same day for sorority sister Tree (Jessica Rothe). It always starts the same way, with her waking up in the dorm room of Carter (Israel Broussard), the sheepish nice guy she met the night before, too many drinks into a campus bender. It more or less ends the same, too, with her death at the hands (and often knife) of a maniac in a plastic baby mask. In between, Tree creates variations on her routine, breaking a pattern of encounters with the regulars in her life. But no matter how she alters the trajectory of the day, it still leads straight to her violent demise, then resets, sending her back to that dorm room to do it all over again. Happy Death Day is even less effectual as a slasher movie, though. Yes, redundancy is kind of the point here, but did all the kill scenes have to unfold in basically the same bloodless way, with the plucky birthday girl creeping around some secluded location, briefly fighting off and then fleeing her attacker, before getting stabbed, strangled, bludgeoned, etc., for the umpteenth time? (The PG-13 rating doesn’t help.) Inherently negating any life-or-death suspense, the skipping-record structure is more conducive to comedy—and that’s how director Christopher Landon (Scouts Guide To The Zombie Apocalypse) often plays it, relying heavily on his star’s elastic screwball reaction shots. Of course, at its core, the model is still the Phil Connors self-improvement plan. “You live the same day over and over again, you kind of start seeing who you really are,” Tree solemnly remarks around the 12th respawn. In trying to finally make it to tomorrow, will she become a better housemate, a better daughter, a better version of herself? Will she notice that the everydude who brought her home but didn’t take advantage of her is actually a great catch? Will she stop ignoring her very own Ned Ryerson, the canvaser harassing passersby about the environment at nine in the damn morning? Twenty-five years ago, Murray and writer-director Harold Ramis wrung this ingenious conceit for everything it was worth. All a diverting riff like Happy Death Day can do is throw a Halloween costume over recycled pleasures and hope they look like its own. At least the closing dialogue exchange makes a self-aware point: If you’ve never seen Groundhog Day, the déjà vu won’t be so suffocating. Wait, where have we heard this one before?